chola dal recipes | Indian chola dal recipes | Split cow peas recipes. Chola dal is used in Indian cooking extensively in Gujarati food. You can make dhoklas, pankis and pudlas from it. yes, we have used chola dal instead of rice to make dhoklas. Loaded with greens, this quick and easy steamed chola dal dhokla recipe gives you a burst of nutrients – fibre, vitamin A and proteins. We have made use of chola dal, which is hardly used in everyday cooking despite being so healthy. Together with greens like spinach, fenugreek leaves and dill, it makes a very, very tasty snack. Diabetics have the option to try the chola dal diabetic dhokla recipe. 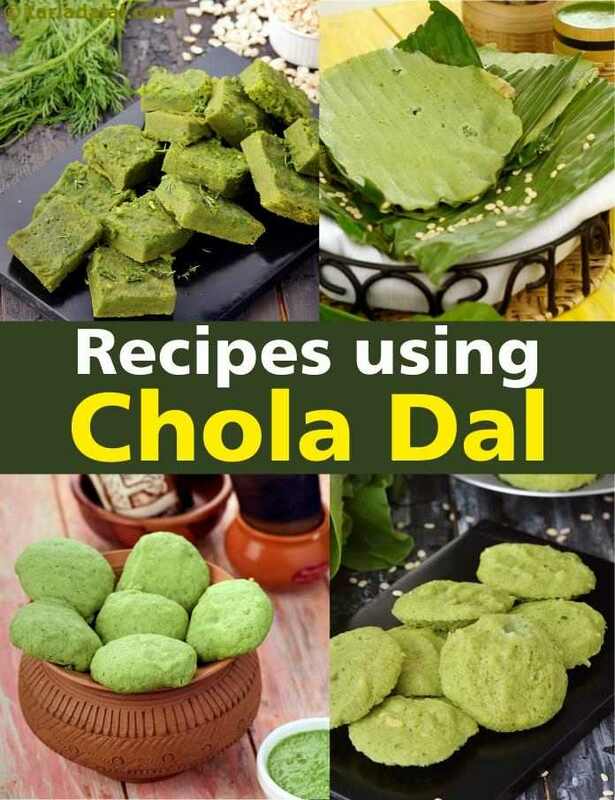 Use palak, methi and create the palak methi chola dal dhokla recipe where a batter of chola dal is fortified with a couple of tasty greens and cooked into yummy dhoklas that have a tempting aroma and nice flavour. Since spinach and fenugreek leaves are used, this non-fried snack also imbibes the characteristic flavour of fenugreek, which is very appetizing. Pankis are made with rice flour but here we have used dropped the rice and used chola dal to make a healthier chola dal panki recipe which is diabetic friendly. A traditional Gujarati dish, Chola Dal Pudla recipe is a scrumptious pancake made of a batter of soaked and ground chola dal fortified with chopped fenugreek leaves and other common flavour enhancing ingredients. This is a perfect healthy evening snack to have. Enjoy our chola dal recipes | Indian chola dal recipes | Split cow peas recipes below. 3 dal khichdi is a rice preparation with three lentils or dals mixed with rice and spices. The 3 dal khichdi imparts an unique taste and consistency as compared to the traditional rice-dal khichdi. Mix dal bhajia is a deeply fried crispy snack recipe with mixed dals as main ingredient. The mix dals are ground together with garlic, coriander leaves, green chillies and jeera powder. The mix dal paste is then deep fried in hot oil and served with tomato sauce. Doodhi vadi nu shaak a new version of bootle guard (lauki) shaak with chola dal vadi. You are sure to fall in love with this innovative chola methi dhokla recipe prepared from a batter consisting of a delectable blend of chole or chick peas with methi leaves and green chillies. The flavorful and spicy dhoklas are enjoyed as snack or breakfast with coconut chutney. Mixed dal crisps is a crispy fried flat puris made from mixed dal dough and relished with aloo curry. A creative variation to the traditional besan based dhokla recipe, the dhokla chola methi) is prepared from a batter made from a mix of chola, methi leaves and curd. An instant dhokla recipe, the chole methi adds an unique taste and texture to this dhokla recipe. This is a dal which comprises of five grains and a vegetable which usually people dislike but by adding it makes the dal more tasty healthy and nutritious. This vegetable is none other than ridge gourd or turia. So enjoy!! !